In such questions, we are giving some clues regarding arrangement. We have apply these clues on a circle and using these information, we have to find the solutions of questions associated with them. In this arrangement, we also deal square/pentagon/ hexagon, questions. Before solving type 1 questions, following facts are necessary to know. 1. 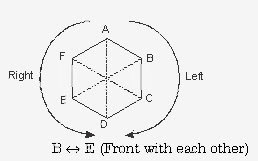 Left movement also called clockwise rotation. 2. Right movement also called anticlockwise rotation.